The Martelorre distills five years of my life down to four ingredients. It’s cocktail as allegory, you might say; if I could save time in a highball. And then combine with ice and stir. Bourbon, paterfamilias of the Martelorre’s alchemy, became a friend to me in 2005 -- not coincidentally the year I began bartending. Compared to all the foolish mixed drinks I’d ordered in my youth, bourbon tasted like maturity’s reward. Adult fun, I used to call it. It spoke to parts of me I hadn’t yet gotten to know -- a spirit that seemed to be a part of mine. So much so that a few years later, when my friend Michelle suggested a dating site she’d dallied on (bourbon, you see, had soldered as many of my subsequent flings as it later liquefied into ruin, and at times in between served quite obviously as my stand-in boyfriend), my brown buddy was listed alongside Otis Redding, A Hard Day’s Night and my dog as what I liked best in the world. Bourbon and Otis were noted on Sean’s profile, too. We had our first date at PDT, where he insisted on covering the $189.66 tab, which we’ve since framed and hung on our bedroom wall. And so Rose Martelli and Sean Lorre co-authored a drink, our merged surnames taken as its portmanteau title, which we served at our wedding in June. Trickier than that forever-union-of-souls thing was devising a drink that could be made quickly and en masse, and that imparted bourbon's essence without offending non-bourbonites (whom I've just now decided to call "sub-bourbonites"). So we borrowed from the mint julep's crowd-pleasingness, cut through with lemon, and chose ginger beer because it's light without being saccharine, it gets along with all those involved, and it's much cooler than ginger ale. Muddle the lemon and mint in the bottom of a lowball or highball glass. Add cubed ice to fill glass. Pour bourbon. Top with ginger beer. Maker’s Mark served us well at our wedding -- and, as at most, was the most top-shelf bourbon available. However, your julep-making bourbon of choice will surely work, too. 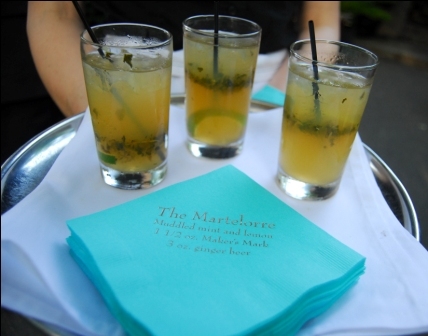 I'll probably soon try making this with Buffalo Trace, the house bourbon chez Martelorre. I haven't experimented with this recipe and rye... yet. We thoroughly taste-tested different brands of ginger beer and found The Ginger People’s product to work far better than any others. Whatever you do, steer clear of Goya, which bore a taste for too sharp (with undernotes of sour, bitter and just-plain-weird) for the Martelorre.